We couldn’t visit Guatemala with out going to Tikal, one of the largest and most significant cities in the ancient Mayan world. The kids were 3, 6, and 8 and I read as much as I could find online to make sure they would be able to handle the hiking and to figure out how to get there. The more I researched, the more I knew we had to make sure to include this stop in our itinerary. I was fortunate to get us a plane ticket that flew into Flores (the closest town to Tikal) and out of Guatemala City 2 weeks later. 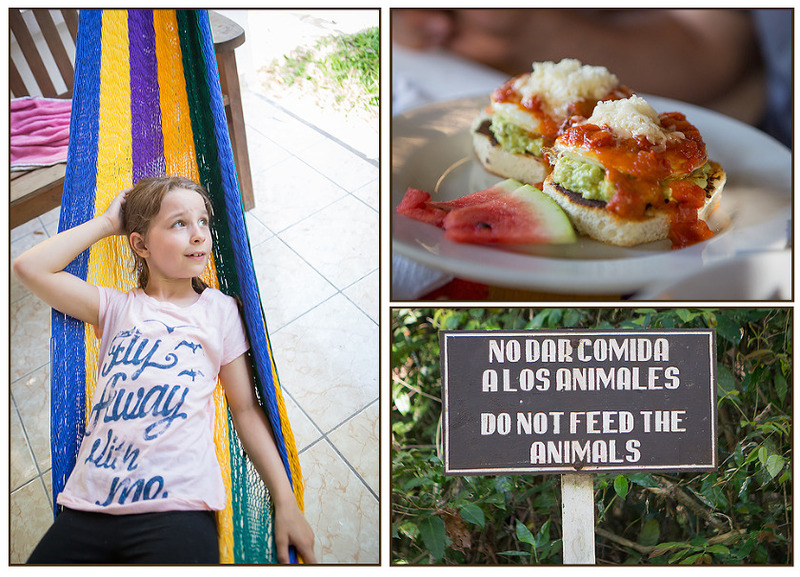 After a connection in Guatemala City and a short final flight into Flores, we met up with our shuttle van and headed out to the Jaguar Inn, one of only 3 hotels that are located in the park within yards of the entrance to the ruins. Although night was falling, we were glued to the windows throughout the 45 minute drive. It was Sunday, and the residents of the small villages on the way were all out playing basketball and attending festive evening church services. Every so often, we would see animal crossing signs with outlines of jaguars, turkeys, snakes and coatimundis. When we arrived and got in line to check in behind a group of exuberant Australian backpackers, the exhaustion from an entire day of traveling hit and we gratefully piled into the beds in our simple but lovely bungalow and crashed. In the morning, we awoke to a jungle paradise. Sipping coffee on an outdoor patio, we observed feisty coatimundis (a raccoon/weasel-like animal), green parrots, and 2 grey foxes. We were told that the sneaky coatis sometimes come into the restaurant at night and steal the sugar from the tables. Birds, insects and frogs filled the air with their songs. The kids ran around playing soccer with a coconut. Armed with bug repellant in every form imaginable (even bracelets!) and thick socks, we marched out of the hotel and towards the gate to pay for our entry into the park and get a map to explore on our own. A man with a large automatic weapon sat guard by the ticket booth, causing me to wonder what type of threats they had to deal with out here in the wilderness. The paths were well groomed and lush, and we studied the map, planning a route that would take us to see as many of the temples as possible, in a circular route. After we had been walking for about 15 minutes, the kids began to melt down. Flynn decided out of nowhere that he was deathly afraid of the giant ants and was crying. Claire joined in and was jumping around screaming. Skye complained that her legs hurt. The idyllic day of jungle exploring I’d envisioned now seemed out of reach. And then, as suddenly as it came on, the storm passed and the kids calmed down. We studied the leaf cutter ants up close and talked about how to step over them. We saw our first spider monkey swinging in the trees above us. And for them (and us!) the day turned into a fun adventure. We ended up spending about 5 hours hiking through the complex. The size and variety of the temples and other structures is awe inspiring. And amazingly, we saw very few other people there. I honestly cannot believe that such a place is not overrun with tourists. It felt like we had the place to ourselves. We saw so many ruins, from the enormous Temples I and II and the pristine Great Plaza courtyard, to crumbling overgrown structures that have not been completely excavated. The kids ran through the buildings and climbed up stone steps, pretending the tunnels were portals to another dimension. My favorite part of the day was when a nice man we ran into told us to veer off the path near Temple III at a certain spot to see some monkeys. We followed his directions and found ourselves in a clearing ringed with huge trees. The branches were teeming with monkeys, above us, around us. Lanky spider monkeys and big, grumpy looking black howler monkeys. I have never seen so many in the wild before, and so close. One baby howler monkey was curious about us, and dangled down from his branch, hands outstretched towards us, while his lounging elders looked on. It was magical. The 5 hours flew by and I was impressed with the kids’ stamina. We arrived back at the Jaguar Inn for dinner and booked a sunrise tour for the following day with resident tour guide Carlos. That meant waking up at 3:30, and meeting at 4 in the darkness in front of the inn. 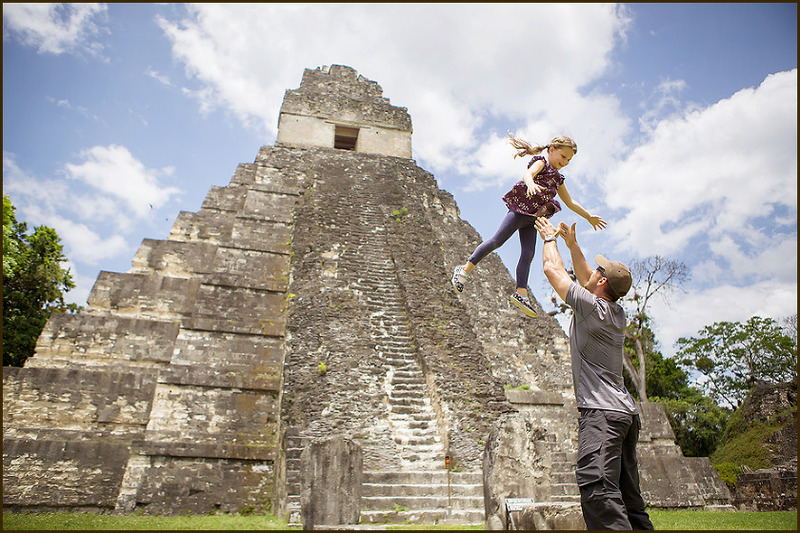 The sunrise tour brings you to the tallest temple in the Mayan world, Temple IV. Many people feel that it is a spiritual experience watching the sun come up from that vantage, and it has the added excitement of being the location where the rebel base was filmed in Star Wars Episode IV! Handing out flashlights, our guide instructed us to stick together and we stumbled awkwardly through the darkness, holding hands so as not to trip over the invisible roots and stones on the pitch black path. After nearly an hour, we arrived at the base of the temple and climbed the steps to the top. There we found a place to sit among the other early risers and sat in silence to wait for the sunrise. The top was made up of steep horizontal stair steps, so it almost felt like theater seating, with the tips of the other stone temples poking through the misty jungle canopy below us as far as we could see. It was especially important for the children to be quiet for the 45 minutes or so until the sun was up. We had a long talk with them beforehand and provided gummy bears, and they did a great job sitting in silence so that the people who had come here for a “spiritual” experience would not be disturbed. Unfortunately one can not necessarily control all bodily functions, and one of the kids innocently broke the peace with gas echoing thunderously across the stones. Apologies to anyone who’s meditation was interrupted. The sunrise itself was mostly obscured by the fog that morning, but it was still a lovely experience watching the jungle wake up from above. The air slowly got lighter and lighter, and birds and monkey began their morning routines in the trees. We climbed down to the bottom together. While we waited for the rest of our group to descend, the girls used a stump to set up a tea party, complete with place settings fashioned of leaves and twigs. Once everyone was back together the guide walked us back through the temples, stopping frequently to explain the history of the temples, Mayan culture, and to point out wildlife and interesting plants. Some of the temples were ones we had seen the day before, but now we viewed with new eyes after hearing Carlos’s descriptions. I felt a chill when he showed us an altar in a sunny courtyard where he explained the human sacrifices occurred. He said they usually happened at the bottom of the temple and involved removal of the heart from a living person. It always feels strange to be in a quiet place where so much history has taken place and imagine the dramas that unfolded through the centuries in the same space you are standing in. We also stopped to watch a toucan take flight, examine coriander and pepper plants, and the “chewing gum tree” whose thick white sap is apparently used to make gum. Claire and Skye got to feed a tarantula with tiny grasshoppers caught by the guide. They dropped them onto the edge of a hole and the hairy beast grabbed them and scuttled back into it’s tunnel. We also saw another tarantula, this time in a grey fox’s mouth as it ran across the courtyard we were standing in. Don’t see that every day! 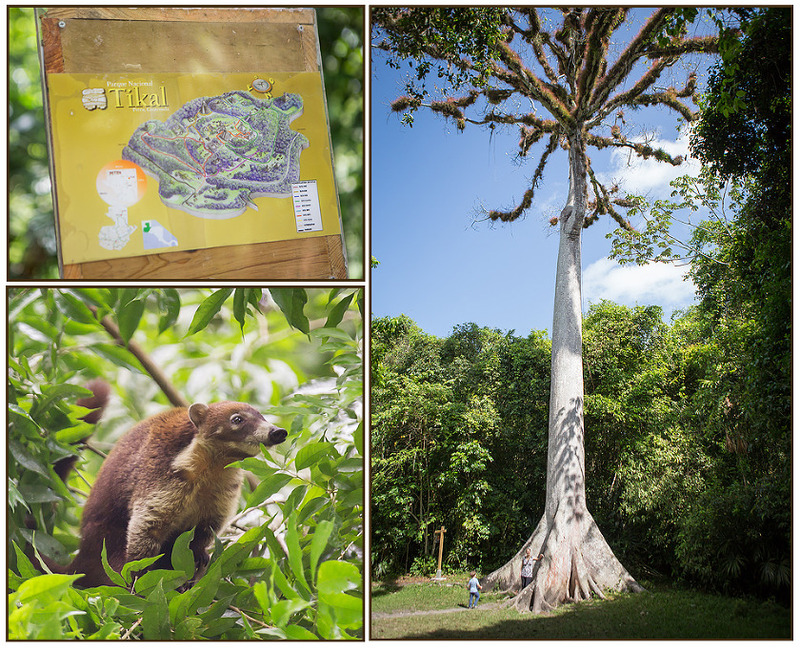 Between the wildlife and history and incredible structures, Tikal was more amazing than we could have imagined and a wonderful family adventure. Monika - Yes, you definitely need to visit Tikal if you’re in Guatemala. I stayed in Flores, which was a much cheaper option for a backpacker, but I guess staying next to the ruins is much better for the atmosphere.